"The event is a great showcase of Bristol's vocal talent. It was extremely varied and very enjoyable. I think it makes great use of a lot of the City's music venues and creates a good buzz about singing and music in general." "The final concert at St George's was again magnificent. The diversity of the performances and workshops on offer is the strongest part of the festival ." 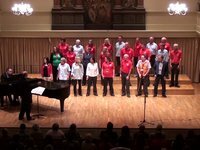 "The fact that it brings together such a diverse collection of performers from traditional choirs to small ensembles of all different styles is to be applauded and encouraged. To my knowledge there is nothing similar being offered to the public in Bristol and therefore the Festival of Song should be nurtured and hopefully secure some funding to help it continue its good work." "Enjoyed the scope and variety of singing on offer. Lunchtime concerts my favorites!" "It's great to connect different types of singing groups in Bristol and also to get to hear choirs/groups that we otherwise wouldn't get to hear about." "Thank you so much for the enormous amount of time and energy you put into organising this Festival." "Every child, young person and adult has a right to sing, because singing connects across all ages, races, faiths and cultures. Everywhere I go now across England, singing is alive and well, thanks to the work of Sing Up and its brilliant supporters across the country, and gatherings and celebrations such as this festival serve to re-establish a vibrant culture of singing for current and future generations. Gathering Voices is comprehensive, inclusive and connective in its mission, and makes it clear that Bristol is staking its claim to be a 'singing city'. I applaud every bit of your work, and wish you all the best for the festival."